footballsite - a look back at the front page photos and the stories behind them on footballsite. The latest Front Page Pictures are on the Home Page - but here are the ground pictures from previous weeks. Other photo pages - Players, managers & fans - team groups. I was at Stamford Bridge the other week to see mighty Peterborough beat Chelsea (OK it was the Checkatrade Trophy!) and have to say that the ground has changed a tad since this picture was taken in August 1974. The massive East Stand had then just opened (you can just see the edge of it on the right hand side) leaving the pictured North Stand as a bit of an unused eye-saw. Half had been demolished and the bit left would soon go the same way. Building work had begun on that North Stand just before the Second World War had started in 1939 and was still unfinished when used for the first time after the war had ended in 1945. Stamford Bridge was the home of both football and greyhound racing at that time and that stand proved to be a popular viewing area for the dogs - the greyhound authorities had stumped up most of the £20,000 cost of the building work. The match pictured was the First Division fixture between Chelsea and Burnley and shows Paul Fletcher challenging Chelsea 'keeper Peter Bonetti. Chelsea took a 3-0 lead but at the final whistle it was 3-3. It's hard to believe that Premier League football is now being played on the site of this picture - well at the moment anyway! The picture is of the original Craven Cottage. Built in 1780 this Craven Cottage was destroyed by fire in May 1888. Fulham took over the derelict site in 1894 and spent two years building a new ground with their first match there being on 10th October 1896, a 4-0 Middlesex Senior Cup victory over Minerva. The pictured Craven Cottage was situated near enough in what is now the centre circle of the Craven Cottage stadium. You could almost imagine the person in the picture being a ref! Hull City in action in their Division 3 (North) match against Carlisle United in March 1958. It's a bit before my time - I well remember the floodlights at their former Boothferry Park ground but my memories are a tad later when they had six huge floodlight pylons at least one of which was behind a stand. I'm guessing they changed from one unusual floodlight set-up (pictured) to the unusual array I remember when a stand was rebuilt. When would that have been? Well this is a sight we will never see in England again - a massed bank of thousands of supporters...watching a friendly would you believe! It was at Hillsborough on February 23rd 1972 when Sheffield Wednesday entertained Santos of Brazil who included in their ranks their star player, Pele. Amazingly the match kicked off at 2.30 on a Wednesday afternoon as a miners strike had resulted in power restrictions which prevented the use of floodlights. Even so the attendance was 36,996 who most Sheffield schools having truancy problems on that Wednesday! Santos - who had also played a friendly at Hillsborough ten years earlier - won 2-0 with Wednesday player Tommy Craig sticking rigidly to Pele in the last few minutes of the match - so that he could get the great man's shirt at the final whistle! Well, you wouldn't see a picture like that in one of the newly built football grounds would you. Watching a match from your own front garden would be an impossibility in one of those and I'm guessing sitting on top of a hut would break every health and safety rule known to man. The picture is of the Goldstone Ground which was home to Brighton & Hove throughout their League history until it was controversially closed and was sold in 1997. Brighton then had to ground-share with Gillingham and play at the Withdean Stadium in Brighton before finally getting a new home - the Amex Stadium - in 2011. The picture was taken in the 1982/83 season, their final season in their first stint in the top flight. They were in financial trouble and found it hard to attract break-even crowds of 16,500 so over Christmas and New Year they reduced their admission price from the normal £2.50 to £2 for the fixtures against Southampton (21,794), Watford (15,139) and Nottingham Forest (10,402). Or you could have watched it from your garden! I was at a live televised match the other day and I was surprised to see somebody sitting near me watching the match on his device rather than what was going on in front of him - and it wasn't as live as I thought it would be! But I must admit the technology employed in football nowadays is light years ahead of what was around when I was a tad younger with VAR being the latest addition. Going right back to the 1930s though Arsenal were way ahead of the others as far as innovation was concerned with their manager Herbert Chapman being considered one of the great forward-thinkers in the game. Their 'technology corner' of the period at Highbury is pictured. The scoreboard idea will be familiar to many with the half-time scores - and sometimes the full-time ones - being given although you did need to buy a programme to get the code for the matches being played. I've seen team changes on an electronic scoreboard but I'm guessing on Arsenal's manual one that it was perhaps using players numbers from the programme again. Can anyone help with that one? Its the clock that has become iconic at Arsenal. It's the original clock pictured - that was a 45 minute count-down clock but that had to be scraped as FA considered that it undermined the match officials. A standard clock replaced it and the rest, as they say, is what history is made of! Following on from the previous picture this was the Vicarage Road Recreation Ground soon after it had been transformed into Watford FCs Vicarage Road Ground. The picture has been taken from a similar position although this time the famous allotments are in view to the right. Watford played their first match at the ground in 1922 with this picture being taken around 10 years after that. As with most grounds of the era it was very much one for the standing fan with stands - or indeed any covered area - being very absent. Also absent is the penalty 'D' marking on the pitch which wasn't introduced until 1937. When Watford outgrew their Cassio Road ground they moved to a new home on the site of the Vicarage Road Recreation ground, pictured above. In proved a perfect site for the new ground which was bordered by houses, an old Workhouse on the site of a hospital and a steam laundry housed in a former silk mill. The famous allotments are out of sight on the right hand side of the picture. The slope on the left hand side of the site was well used by kids as a slide - on sledges in the snow and tin trays at other times - and was perfectly suited for the terracing which took its place when the ground was constructed. The Vicarage Road ground was opened in a match against Millwall on 30th August 1922. Long before computers came along mistakes were still made on the scoreboards - this one being at Loftus Road on 27th January 1973. Even the most optimistic Burnley fan wouldn't have expected to be 9-1 up after a little more than a quarter of an hour of the Saturday afternoon match. In fact it was Queens Park Rangers who recorded a famous victory that day. Burnley and QPR were red-hot favourites to win promotion from the Second Division in 1972/73 with Burnley having lost just one of the 25 League matches they had played up to the visit to London but QPR triumphed 2-0 in front of a season-best 22,518 crowd at Loftus Road. Burnley and QPR filled the two promotion spots at the seasons' end with Burnley taking the title by a point. Aston Villa finished a distant third. I did the tour of Craven Cottage once and still remember the warning given - don't even think of stepping on the pitch if you want to carry on living (well, something like that anyway!). So I was surprised to see pictures of Fulham's first 'Picnic on the Pitch' which took place at Craven Cottage in May 2015. OK it was after the season had ended and was held to aid season tickets sales but people are walking on the pitch and a tent has been erected on it!! I guess the ground-staff were all the given time off to avoid the event or surely there would have been palpitations all round that day. But a good idea I guess. Well, I think that I've seen it all now. I had thought that the Russians would have had all the 2018 World Cup venues sorted to perfection but it seems not quite. One of the venues, the Ekaterinburg Arena which is the home of Russian Premier League side FC Ural - has a normal capacity of 27,000 but there's a 35,000 minimum requirement for matches in the World Cup finals. So the ground will have two temporary stands to extend the capacity to 45.000 - but both of them are situated OUTSIDE the normal ground. Now that's novel! I must say that it obviously won't matter to those of us watching on television but the fans who will be parting with their hard-earned to buy tickets might not be too chuffed if their seats are at the back of those temporary stands, especially if it is raining! Well, there was a time in the 1960s when if Newcastle United's fans forgot the name of the club they supported they got a gentle 50 foot high reminder by visiting the West End stand at St James' Parkl. Surely the biggest club name banner in football?? The West End stand at Newcastle was opened in 1906 - it cost £8082 14s 11d - and for many years it was the only stand at St James' Park with the other three three sides being vast open terraces. It survived until the Valley Parade fire of 1985 when new safety regulations saw it demolished and replaced by the Jackie Milburn Stand - and that one cost over £5 million. The ultimate in comfort I guess - but not the same in character! April 27th 2017 and the Airware Stand at the former Nene Park home of Rushden & Diamonds is no more than a pile of rubble. The dream that was the smallest town ever to host League football has now long gone. Sadly. A picture On April 6th 2017 at the former Nene Park home of Rushden & Diamonds. As the demolition progresses I'm getting more annoyed. The Airware Stand is the last still standing but it won't be for long, and even the seats are being destroyed - surely they could be recycled somewhere? Its a new stand - and a fairly new ground - and many lower division Football League sides would have been proud the have the Airware as part of their ground. But its all going - a disgrace to football and vandalism at its worst! A picture taken at the end of March 2017 and soon the former Nene Park ground of Rushden and Diamonds will be no more. An absolute disgrace. Two decent non-league sides, Irthlingborough Diamonds and Rushden Town were combined and then followed an amazing progression until Rushden & Diamonds became a Football League side. Then the rich-man owner walked away from that particular toy and the club found it impossible to survive. OK, League football in Irthlingborough was never going to be sustainable but for locals to lose that as well as the historic clubs and the Nene Park ground that were the basis of that achievement is incredibly sad! Upton Park - or more correctly the Boleyn Ground - pictured in 1981. The home of West Ham United for 112 years, the first match there was a Southern League match against Millwall on September 2nd 1904 and the last was that troubled Premier League match against Manchester United on May 10th 2016. During that time the Hammers played there 2398 times with their best crowd being 42,322 for a First Division match against Spurs on October 17th 1970. The ground capacity had reduced to around 35,000 by the time they moved to the Olympic Stadium where their average attendance is just a tad below the ground capacity of 57,000. Geoff Twentyman to Liverpool - the transfer fee paid for a new, tad more modern, stand. One of my favourite pictures of the original Wembley Stadium being built - definitely before the days of Health and Safety! The new national stadium was the centre-piece of the site chosen for the 1924 British Empire Exhibition which was constructed in parkland near Wembley which was then a little more than a village on the edge of London. The stadium itself was built in only 300 working days between January 1922 and April 1923. Some 150,000 tons of clay was removed from the hill that occupied the site while 25,000 tons of concrete, 1,400 tons of steel and over half a million rivets were used in the stadiums' construction. It was finished just days before the first match at the ground - the 1923 FA Cup final between Bolton and West Ham - when around 300,000 turned up for the only Wembley FA Cup final that was not all-ticket. Around 200,000 got in, although the official attendance was a record 126,047, to see Bolton win 2-0. Fast forward then to 2003 when those twin towers were demolished - I still think that was an act of totally vandalism! A picture pinched from the front cover of the Stockport County programme of 1986/87...so I'm taking a wild guess that it's Edgeley Park in 1986/87! Grounds staging both football and rugby matches are common now but when Stockport first played there in 1902 (at the start of their third season in the League) they shared it with the Stockport rugby team who had been there since 1891. But by 1903 the rugby club had gone bust leaving County in sole charge of the ground. County have been there ever since - they have played in the second tier of the League, set a record attendance of 27,833 for an FA Cup match against Liverpool in 1950, made regular trips to Wembley and even had George Best playing for them at the ground. Sadly in more recent years Stockport County have dropped to the National League North and had to sell the all-seater ground to the local council to prevent the land being used for housing. Fingers crossed, their fortunes will improve soon. An interesting picture of the progress being made in building Tottenham's new 61,000 capacity ground which is due to be up and running at the start of the 2018/19 season. It clearly shows that at some point soon Spurs will be losing the use of the White Hart Lane ground that has been their home since 1899. Despite the disappointment of their Champions League campaign at Wembley in 2016 the national stadium is likely to be their temporary home in 2017/18. It might be a profitable move though with the 85,512 Wembley attendance for the Spurs v Bayer Leverkusen Champions League group match being the highest ever attendance for any 'home' match for an English club side. That crowd just beat the attendance earlier in the season against Monaco at Wembley with the previous English best being 84,569 at Maine Road for a Manchester City v Stoke FA cup tie in 1934. The best at White Hart Lane was 75,038 for an FA Cup tie against Sunderland in 1938 - the current WHL capacity is less than half that amount. A picture of what was state-of-the-art pitch preparation back in 1958. No, not a system to give an electric shock to the ref every time he got a decision wrong but the first undersoil heating system which was installed at Everton's Goodison Park ground in the summer of 1958 to combat the serious problem of frozen pitches causing abandonments and postponements. Around 20 miles of electric heating wires costing around £16,000 were laid a few inches below the surface. Funnily enough it proved too successful - there was so much melt-water that the drainage system couldn't cope and two years later the pitch had to be dug up again to install an improved drainage system! and a few more were to follow in years to come. bloody battle in the Boer War. It was one of the highest embankments in English football with the uncovered terracing having the reputation of being bitterly cold in winter although the Kopites gained a degree of comfort when a roof was added in 1928.In its heyday the Kop accommodated around 30,000 standing fans but that figured had been halved by the time of its closure. The Taylor report which followed the Hillsborough disaster brought standing in the top divisions to an end and the final match for the standing Kop came on Saturday 30th April 1994 when Norwich gained a 1-0 Premier League victory. One of my favourite pictures of the City Ground home of Nottingham Forest taken in the year it opened, 1898. It looks a very basic ground which was partly due to the fact that the club was run by a committee and so money was tight. Crowds were also a bit more sparse in those days. The first match there was a Division 1 fixture against Blackburn Rovers on the opening day of the 1998/99 season, September 3rd 1898, when 15,000 were present to see the visitors win 1-0. Only the local derby against Notts County had a better crowd at the City Ground, 16,000, with the top crowd of their season being the return at Notts County, 20,000. Several of Forest's home League matches saw crowds of just 3,000 present, including their match against Liverpool (things would change!). County were better supported that season, and finished above Forest in the First Division table! If the modern Cloughie stand could be superimposed on that picture it would dominate the whole area! Pubs and football grounds seem to go together very well, although not usually as a perch to watch a match from! The Old Peacock Pub is next to the Elland Road home of Leeds United and is pictured in 1972 - health and safety hadn't been invented then! Leeds were involved in one of the closest finishes to a top flight season. Derby won the title finishing a point ahead of Leeds (2nd), Liverpool and Manchester City (1971/72 League table & results). This picture though was taken at an FA Cup 4th round replay with Liverpool which had kicked off at 2.30 on a Wednesday afternoon in February. The reason? The miners were on strike and in those days no coal meant no electricity and so floodlights couldn't be used. Not that the unusual timing did much to keep the fans away with the attendance of 45,821 - plus the ones on the roof - being Elland Road's third best crowd of the season. but it was on September 8th 1888 that the ground won its place in football history. matches - Bolton lost 3-6 to Derby County in front of 5000 spectators. after the landlords upped the rent from £35 - a year! - in 1888 to £175 five years later. Bolton played their last match at Pikes Lane in 1895 and then moved to Burnden Park. houses were built on the site! Bristol Rovers former Eastville Stadium home was probably best remembered by most for the flower beds behind the goals and the aroma from the local gas works. A more tragic memory would be of the fire that destroyed the South Stand in August 1980 following the first Division 3 match of the season, against Orient. Rovers were then forced to play their next five League and Cup matches on 'enemy' territory - Ashton Gate. Their final match at Eastville was in April 1986 with Rovers then moving to share Bath City City's Twerton Park ground before arriving at the Memorial Ground. Eastville is now the site of an IKEA store. cost to build the new stadium a few bob could have been found to incorporate those towers into the new building or move them somewhere else. To me it was vandalism at its worst when they were demolished. As I turned round and walked away after taking the photo there was a clap of thunder - in January! That just about summed up what I thought. Anyway the old ground was with us from 1923 to 2000 which the new ground staging its first matches in 2007. Fires in wooden stands were once not uncommon although thankfully never with the tragic consequences of the Valley Parade disaster. On April 3rd 1950 a fire in the West Stand of the former Leeds Road home of Huddersfield Town destroyed most of the upper tier and roof. The club were forced to play their next two matches at the Elland Road home of Leeds United and ironically in the second of those matches - against Newcastle United - the 37,766 crowd was their best 'home' attendance of the season. The stand was rebuilt during the summer and re-opened at the start of the 1950/51 season. Huddersfield played their last League match at Leeds Road on 30th April 1994 against Blackpool before their move to the Alfred McAlpine Stadium. One of the iconic sights at a football ground over the years was the clock at Arsenal's former home at Highbury. An idea of Arsenal's innovative manager at the time - Herbert Chapman - the first of many clocks counted down the 45 minutes of each half but it was changed to a standard clock after criticism that the 'countdown' undermined the match officials. Pictured are workers installing the clock in the 1930s - it was originally positioned on the north side of the ground but moved to its traditional home on the south side, the 'Clock End', when the north bank was developed. If you have every been at match and thought it would be more entertaining watching the cars park in the car park you once could have done just that at a former home of Port Vale. Vale played their last match at the Old Recreation Ground on 22nd April 1950 - Aldershot won 1-0 - and the pitch was rapidly turned into a car park. A car park it remained until the 1980s when it became the inevitable shopping centre. Fulham's Craven Cottage ground in the late 1940's. Just the one stand with the Craven Cottage itself in the bottom right-hand corner. All four sides now have covered stands but in those days the open terraces saw a record attendance at the ground of 49,335 against Millwall in 1938. On boat race day the riverside terracing also proved to be the perfect viewing point for anyone not totally absorbed by the game of football on offer! The whole area looks neat and tidy with not a car or television aerial - or a person - in sight. Whatever you think about the global warming debate there can be no argument that the winter months of 2015/16 have seen some extreme weather conditions with tragic consequences in various parts of the country. As far as League football goes Brunton Park in what has become Carlisle-on-Sea has been worst hit. Flooding at the ground is not unknown but this time it has seen the club exiled from their home ground, the pitch having to be relayed and considerable damage to the club buildings. May the sun start to shine in everybody affected. Shocked at the state of the Eastleigh ground for their FA Cup tie against Bolton Wanderers (January 9th 2016)? In days gone by, before undersoil heating became the norm, even the top grounds in the country had pitches that looked more like ploughed fields rather than the snooker-table finish we now expect. Pictured is the Maine Road ground of Manchester City and the treatment it was getting to make it playable for the FA Cup tie against Swindon Town on January 10th 1953. The match was played - and City won 7-0! A piece of footballing history being demolished. Following their move to Glanford Park in 1988 Scunthorpe's former home at the Old Show Ground was demolished - inevitably to make way for a supermarket! Although they had hoped to dismantle the pictured stand and move it to Glanford Park that idea had to be abandoned because of the cost. When it was built it was the first cantilever stand - a stand with no supporting pillars to block the view - at a British football ground. A local steel company had built it for them on favourable terms hoping that it would be a showcase for other clubs. The stand was officially opened on 23rd August 1958 with Glanford Park staging its last match on 18th May 1988. Back in the 1980's Chelsea weren't alone in suffering crowd problems but their response to an FA warning after a pitch invasion during a League Cup semi against Sunderland at Stamford Bridge in March 1985 was both unique and shocking. 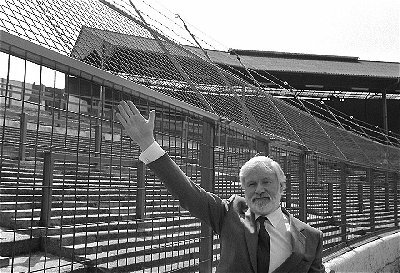 Controversial chairman Ken Bates had a 12-foot high electrified fence built around the pitch which was due to be switched on for a First Division match against Tottenham on Saturday April 27th 1985. Football supporters everywhere were outraged and just 3 days before the proposed switch-on the Greater London Council threatened High Court action - believing there to have been a breach of safety and planning rules - unless Chelsea abandoned their intention of allowing the 12-volts to flow. The match against Spurs was planned to be a celebration of their 80th anniversary of first playing at Stamford Bridge but all the headlines were about that fence. The match ended 1-1 and the electricity wasn't switched on - and never was. up't north in the old days while in contrast this picture shows how they were sold in the south in the swinging sixties. A picture from Stamford Bridge in 1966. I just have a feeling that buying a programme was more part of the routine at Chelsea than at Darlington? match-day experience complete!. That programme that had about 20 pages and wasn't what we get now - a small booklet that weighs a ton, costs a fortune, doesn't fit in any pocket and contains no more information - buts loads more adverts - than those 3d publications. The programme hut at the old Feethams home of Darlington - but a bit more recent than when programmes cost 3d I think! Cardiff City v Chelsea at Ninian Park in March 1921. Over 45,000 were assembled for an FA Cup 4th Round tie with every conceivable vantage point being taken. No way would that be acceptable now - Health and Safety would see that match abandoned...and to be fair I wouldn't fancy standing below that lot on the roof! Cardiff won 1-0. I still think that the demolition of the Twin Towers at Wembley was an act of total vandalism - surely there was enough money around in football to take them down and rebuild them as part of the new Wembley. But at least that left the Twin Towers of Darlington with the entrance to the old Feethams football ground/cricket ground having a passing resemblance to the Twin Towers of Wembley - providing you've got a good imagination that is! Sadly even they went. After Darlington left the Feethams for the Arena (what a disaster!) in 2013 the towers where taken down down and rebuilt nearby to make way for a housing development on the old ground. But - of course - they don't look anything like the days when thousands of fans passed through them on the way to a match. between the pitch and the stand. Really - unique or what? And I guess rather than be able to park the proverbial bus in front of the goal if they could build a siding they could park a train between their goal and the opposing forward line! A brilliant picture of Maine Road, the home ground of Manchester City between 1923 and 2003. In 1934 it hosted the highest attendance at a League ground in England - 84,569 for an FA Cup quarter final against Stoke City. It clearly shows the different styles of the stands built over the years and the lack of space round the ground. Whether you are a fan or not of the new grounds like their current Etihad home they generally have enough space around them to swing a cat! was being demolished. Sunderland's first match at their old ground was on 10th September 1898 when 30,000 were present for First Division match against Liverpool. I've always wanted to watch a match from the Cottage at Craven Cottage. bales of hay at White Hart Lane in the 1920s! postponed because of a frozen pitch? No way - nowadays you just press a button to switch the undersoil heating on. But back in the 1920s the state of the art method of preventing a frozen pitch was...straw! A picture of White Hart Lane on a day when hundreds of bales of straw were put on the pitch to keep the frost at bay. And then it all had to be taken off again not long before the match was played. Amazing. to the newly-built Stadium mk at the start of the 2007/08 season. The National Hockey Stadium has since been demolished. to make way for the modern all-seater ground. Peter Shilton.......you never lose those memories! The pitch was then moved over towards the Main Stand leaving space the other side where the Glebe Road terraces were constructed (later replaced by the family stand). Amazingly this was all done when Posh played in the Midland League although attendances in those days regularly topped 10,000.
from 1987/88. Scarborough first used their Seamer Road ground - later called the McCain Stadium - in 1898 and it remained their home until they went bust in 2007. The ground then fell into disrepair until demolished in 2011. It's hard to believe that the pictured ground hosted the likes of Arsenal, Liverpool and Manchester United in League matches until the early 1990s. Plough Lane had been the home of Wimbledon from 1912 with the ground first hosting Football League football when Southern League Wimbledon were elected to the competition in 1977. Amazingly by their tenth season in the competition Wimbledon were in the top division and in their 11th season they won the FA Cup! The club played their last League match at Plough Lane against Crystal Palace on May 4th 1991 before moving to a groundshare at Selhurst Park and eventually to Milton Keynes. Plough Lane was used until 1998 as the home for the reserve teams of Wimbledon and Crystal Palace but was demolished in 2002 and later became a housing estate. Wembley, Saturday April 28th 1923. The first match at the stadium, the FA Cup final between Bolton and West Ham. The official attendance was 126,047 but perhaps 200,000 got into the ground - it was the last FA Cup final not to be all-ticket. What I find amazing about the picture is that London is missing, Wembley appears to be in the middle of a field! Things have certainly changed over the past 90 years or so. Over the years football clubs have shared their grounds with some unusual neighbours. Probably the best example of that is at Everton's Goodison Park ground. When Everton played their first match at Goodison in 1892 there was a church in the corner of the ground and St Luke's Church is still very much there and has become an important part of of the Everton scene. In recent years the church premises at the corner of Goodison have been used to dispense refreshments to the masses but in years gone by the roof of the church was used by spectators to watch the match. I'm not sure when that was - 4 bob (20p) to get in so it had to be years before there were any thoughts of Health & Safety! Probably the most unusual ground to stage Football League matches was The Nest, Norwich City’s home ground before they moved to Carrow Road. The Canaries had their home at The Nest from 1908, when they were in the Southern League, to 1935 by when they had progressed to the Second Division of the Football League. What made it unusual was that it was built in the bottom of a chalk pit with one end of the ground being next to the quarry cliff which had a retaining wall some 50 feet high and just a few feet from the touchline – and there were terraces for spectators at the top of it! It was dangerous for the players and precarious for the fans and once a barrier did give way (without any injuries) while on another occasion part of the pitch dropped 25 feet when there was movement in the old chalk workings. For safety reasons Norwich had to move and they signed a lease on a sports ground in Carrow Road in June 1935 and transformed it into a ground which hosted 29,779 fans for a Second Division match against West Ham United just 82 days later. You couldn't get much more East End than 'Only Fools and Horses', the long running TV comedy series which starred David Jason as Del Boy. But in reality the home of the Trotters wasn't in Peckham but far away in...Bristol! The building which doubled as their Nelson Mandela House home was in fact a tower-block which overlooked the Bristol City ground with much of the filming taking place around the Ashton Gate stadium. Sorry if that shatters your illusions! A picture of The Valley home of Charlton Athletic showing the vast terracing which at one time saw the ground as the largest League ground in Europe. On 12th February 1938 a ground record crowd of 75,031 saw Charlton entertain Aston Villa in the FA Cup although the modern Valley has a capacity of a tad over 27,000. Between 1985 and 1992 - when this picture was taken - money problems meant that they had to leave their home and groundshare with Crystal Palace and West Ham United. Well, it's turned chillier recently but with global warming I doubt if we are going to experience the winter we had in the 1962/63 season. The 'big freeze' hit the country just before Christmas 1962 and then followed hundreds of postponements and abandoned matches before the next full programme was played in the Football League - on March 16th 1963. Before the days of undersoil heating clubs tried many different ideas to thaw the pitches, including using flame-throwers at Blackpool and braziers at Stoke City's Victoria Ground (pictured). You can't imagine Stoke's maestro Stanley Matthews playing on a pitch like that! Well it's been all-change at Northern Premier League Stamford over the past few weeks. Saturday November 22nd 2014 saw the Daniels play their last match at Wothorpe Road after 118 years in residence (top picture). On Friday December 5th the first match was played at their new Zeeco Stadium - a friendly between the Stamford Youth side and their counterparts from Blackstone (bottom picture). Certainly a major change! The worst moan seem to be from the St Johns Ambulance man - he had no ice. Ironic really - the temperature felt like about minus 20! Love it or hate it - now that's a matter of opinion! I sat in the old stand at Peterborough the other day - not my favourite stand and although they were new seats they were still a bit 'cosy'. Or should I say no leg room (or arm room)! But they were nothing to compare with the picture above. I don't know if it is a 'naughty' seat for a fan who misbehaves but there seems little other point in having it. I don't know where the picture was taken but if this is what is meant by a restricted view seat I think I would always pay the extra! Sheffield United was formed by Yorkshire Cricket Club in March 1889 just six days after Bramall Lane had staged an FA Cup semi-final which had taken £600 in receipts - the cricket club decided that regular football at the ground would prove successful (Bramall Lane). It did prove successful, so much so that the football club became the senior partner and eventually evicted the cricket club from the ground. Yorkshire played their last County match at Bramall Lane in August 1973, drawing with Leicestershire. The South Stand at Bramall Lane was then built on part of the former cricket ground, finally enclosing the football ground on all four sides. Pictured above is the building of the South Stand with the cricket pavilion later being demolished to make way for a car park. A picture taken in 2014 of what is left of Belle Vue, the former home of Doncaster Rovers. In its time the pitch was considered one of the best playing surfaces in the country, but no more. Since Donny last played there in 2006 before their move to the Keepmoat all the stands have gone leaving just a shell of terraces and pitch. An eerie scene and a long way from the time in 1948 when a record crowd of 37,099 saw them play Hull City at the ground.